460 pages | 2 B/W Illus. In this comprehensive, accessible Handbook, acclaimed social theorist Anthony Elliott brings together internationally distinguished and emergent scholars in the social sciences and humanities to review the major theoretical traditions, trends and trajectories in the hugely popular field of identity studies. 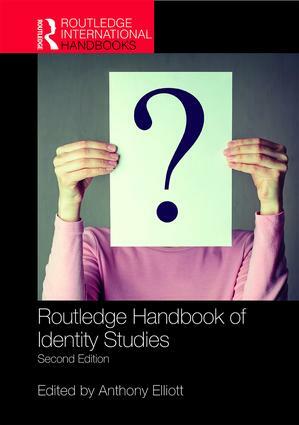 Routledge Handbook of Identity Studies set new standards for reference works when first published, such was the far-reaching sweep of topics discussed – including identity studies reconfigured by feminism, post-structuralism and postmodernism, individualization theories, media and cultural studies, race and ethnicity, consumerism, environmentalism, post-colonialism, globalization and many more. This second edition of the Handbook contains new contributions, including an updated general introduction from Anthony Elliott on the fast-changing conditions and contours of identity transformations in the global age. There are also new chapters on the emergence of posthuman identities - with specific focus on the global consequences of biotechnology, biomedicine, robotics and artificial intelligence for the analysis of identity - and on identity mobilities. The Handbook's clear and accessibly format will appeal to a wide undergraduate audience, as well as researchers and teachers, in the social sciences and humanities. Anthony Elliott is Executive Director of the Hawke EU Jean Monnet Centre of Excellence at the University of South Australia, where he is Research Professor of Sociology and Chancellery Dean of External Engagement. He is Super-Global Professor of Sociology (Visiting) at Keio University, Japan, and Visiting Professor of Sociology at UCD, Ireland. A specialist in the field of identity studies, he is best known for Concepts of the Self, which has been in continuous print for 20 years and across four editions.